Can women be pastors? No! Many women say, “God called me to be a preacher.” No He did not and Scripture clearly proves it! God never called you to do anything that contradicts His Word. There are many famous female pastors such as Joyce Meyer, Juanita Bynum, Paula White, Victoria Osteen, Nadia Bolz-Weber, Bobbie Houston, and more, but they are all in sin. Scripture makes it clear that women are not to have spiritual authority over men. I’m not denying that female pastors can’t teach many things that are biblical and they might have even helped you, but each one of them has twisted Scripture to justify their sin and lust. They can’t be trusted and God is not pleased. Let’s find out what the Bible teaches about this hot topic. The conflict of the sexes was born out of the fall. 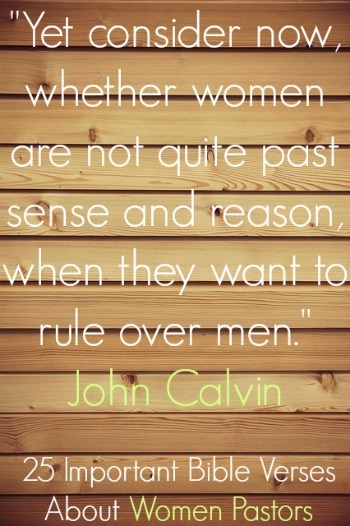 Women would desire to rule over men, but men would instead rule. This is not only in marriage. This same problem enters into the church because many women are not content with their God given role. I want more. I want to be more powerful. I want to be the leader. I want to be over the man. They were not made to be leaders in marriage or in the church. They are not lesser they just have different roles. God is actually protecting women. There is a reason that women live longer than men. They have to go through less stress and pressure because of their God given role. Subjection is a blessing for women. Women need a protector. Even though many women desire to be preachers they are not to. To do otherwise is to be in sin and to usurp the authority of man. Many false teachers try to twist the Scriptures and say things like that is your interpretation. No! That is what it clearly says! No woman should teach in the public worship and service of the church. It all goes back to creation and order. Man was created first, then woman was created for man. Not only that, it was Eve who was deceived by Satan, but sin entered through Adam and not Eve and we were saved by the second Adam Jesus Christ. The husband is the leader and the protector. Instead of questioning Eve the one who sinned first, God questioned Adam the leader. Adam was the head of mankind and Eve was Adam’s responsibility. Eve tried to be the leader. She tried to do her own thing. She usurped Adam’s responsibility in leadership and she was deceived and he subjected himself to her deception. We should also note that Satan tempted Eve over Adam. Women have an essential role that they should never run from. The role of a woman in the church and in marriage is so great that Satan seeks to attack it with the feminist movement and rebellious women who infiltrate Christianity. Women will find true fulfillment through childbearing. Women are given the responsibility of raising up godly children, which is essentially leading the human race to godliness. This is why Satan hates this so much! The godliness of a mother has the greatest impact on a child. There is a relationship between a mother and a child that is unlike any other. Why do you think this generation is getting worse? Many women don’t want to pursue their godly role, but would rather throw their kids in daycare. Why would a woman want any other role when their role not only has a huge impact on their kids, but also the whole generation? Praise the Lord for your responsibility that will bring a blessing to this world. Elders are always men in Scripture. 1 Tim:2 lets us know it is not culturally based like some may say. Feminism has infiltrated the church and it is wrong. Women in leadership is actually a sign of judgment from the Lord. This is really saying something. There are many women who are searching passages to justify a female preacher, but you will never find any women preachers in the Bible. How about Priscilla and Phoebe? There is no doubt that these were godly women who helped advance God’s kingdom, but there is nowhere in Scripture where it says that either of them pastored a church. They didn’t contradict the Scripture. That doesn’t mean that they can’t witness to others. That doesn’t mean that they can’t teach children. That doesn’t mean that they can’t teach other women. Priscilla and her husband did teach someone the way of God more accurately in their home. Did they contradict Scripture? No. Phoebe was not a deaconesses which contradicts 1 timothy 3:8. Women were great helpers in the church, but never did they serve in positions of spiritual teaching authority in the church. Women play an extremely important role in the church and women have many gifts, but they are to use them within God’s design. God used a woman to plant the seed of the gospel in me. Was she shepherding over me? No, but she did proclaim the gospel message to me. Women are still able to use their gifts and tell people about Christ. One time someone tried to use Galatians 3:28 to justify their position, but that has nothing to do with roles in the church. In context it is clearly talking about salvation in Jesus Christ. I was astonished that someone would actually try to use this verse to justify their position. I heard a woman say that the Bible in Ephesians 5:25 says for a man to lay down his life for his wife. She was twisting Scripture to justify herself and I was shocked that she would actually use this verse because if you go a verse back it says wives submit to your husbands in everything. Ephesians 5 also says that a husband is the head of the wife. A man’s headship is an earthly manifestation of our heavenly Father’s leadership. Women can’t accomplish this nor were they designed to. Should I leave a church with a woman pastor? If this shows that they are not properly representing the Word of God why would you want to listen to them? If they are so dishonest about the text why would you let them shepherd you? They can’t be trusted because to justify their position they would have to reinterpret everything. Can the blind lead the blind? You don’t want to go to a church like that. The Bible is as clear as day when it comes to women preachers. You should leave. I’ve heard women say that is Paul’s words not God’s Words. Scripture is God-breathed. Remember this does not mean that women are less than men. Even though Christ was sent by God was He any less than His Father? No. There are some women who do more for the kingdom of God than men. This just means that women are given a different role, but their role is very important. What if the woman pastor only pastors over ladies, like in ladies meetings..? What if the woman pastor is a senior pastor, and she only teaches the ladies, and the men are taught by a male pastor? Biblically women are free to teach other women and children. However, when it comes to women shepherding over men this goes against Scripture. Why would a woman who is a true believer, reborn of the Spirit, and sincerely seeking to be a doer of God’s word and not a hearer only, want to take on the biblically masculine role of a shepherd and watch over the flock? A sister in Christ does not need the title of “Pastor” to teach other women. A pastor is one in authority over others, making decisions for the benefit of his flock according to the will and purpose of God. Remember, it was Eve who was deceived, not Adam.